Poverty is a complex issue that can stem from a variety of reasons that are too difficult for young children to understand. But even though issues surrounding hunger and homelessness are complicated, it’s important to talk to kids about poverty. If you are a parent who doesn’t often worry about putting food on the table or having a warm place for your child to go to sleep, wrapping your arms around this conversation may be quite difficult. But without a clear explanation, kids may not understand why some kids get free lunch at school or why there’s a homeless person asking for money. And they may make inaccurate assumptions about people living below the poverty line. At some point, your child will notice that some people don’t have as much money as others, and he’s likely to have some questions about it. It’s estimated that one in five children in the United States lives in poverty. Many of those children have working parents, but low wages and unstable work leave them living below the poverty line. There’s a good chance some of your child’s classmates struggle with issues like food insecurity and homelessness. You might be tempted to say to your child, “Eat your broccoli. There are starving children in other parts of the world who would love to eat that." But talking about people who live on another continent may be too far removed from your child's world for him to grasp. There are plenty of people struggling with poverty much closer to home. Talking about real-life situations in your community may help him gain a better understanding of what poverty is. Educational problems – Children living in poverty have more trouble learning and they are less likely to further their education. Behavioral problems – Poverty affects a child’s social and emotional development. Children growing up in poverty are more likely to exhibit behavioral problems. Physical health problems – Child poverty is linked to higher rates of asthma, obesity, language development problems, and an increased risk of injury. Mental health problems – The toxic stress associated with poverty increases the risk of several psychiatric disorders. Reduced overall well-being – Studies show poverty is the biggest threat to children’s well-being and it can have lifelong consequences. Holding conversations about poverty can be an opportunity to educate your child as well as a time to foster compassion for others. When your child understands a little more about why some people live differently, he may have more empathy for people who experience poverty. Rather than bring up the subject of poverty out of the blue, look for opportunities to bring it up naturally. Then, you can talk about it more concretely. When there’s a Thanksgiving food drive at school, talk to your child about why you’re donating canned goods. Or, when there’s a gift drive over the holidays, explain that some families may not have enough money to buy presents. Why does Anna wear the same dress to school every day? How come that woman is asking people for money? Why isn’t that man wearing any shoes? Why does Zack say he gets free lunch at school? When your child asks questions, it’s a sign he’s ready for more information. It's important to give him age appropriate answers. At this age, you don’t need to give lengthy explanations about the factors that may prevent someone from earning a livable wage. Conversations about disabilities, substance abuse, and a poor economy can wait until the tween or teen years. In addition to talking about the causes of poverty, discuss the effects. Provide a simple explanation of the government services and the resources put into place to help people, but also talk about how difficult it can be for people to get out of poverty. The things you do, as well as the things you don’t do, will send your child messages about people living in poverty. For example, if you walk past a panhandler without making eye contact, your child may assume homeless people are beneath you, so it’s important to explain why you don’t give strangers on the street cash. Say something like, “I don’t give people money because I’m not sure how they’ll spend it. But I might buy them some food sometimes.” Or, explain that you donate money to programs that help homeless people have food to eat and shelter to stay in. It’s also important to avoid sending a message that implies hard work always prevents poverty. If you say things like, “I work hard so we can live in a nice house,” your child may conclude people living in poverty must be lazy. 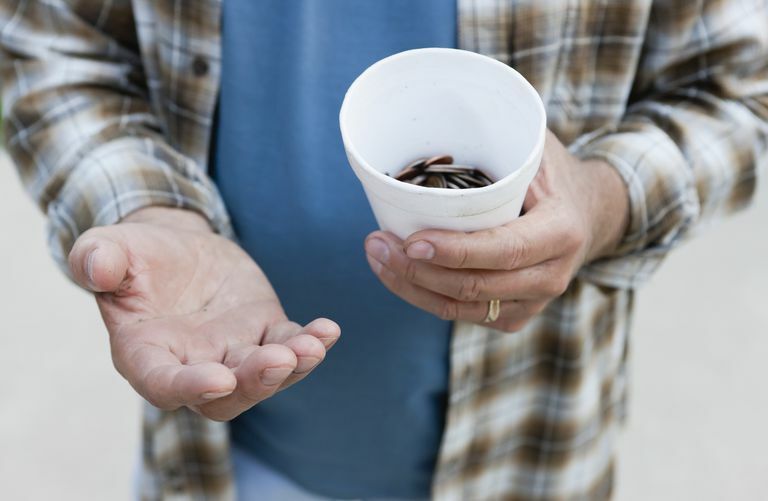 Donating cash to a charity may not teach your child much about helping others. But, involving him first-hand in helping people in need could help him gain a better understanding of how he can address poverty. Get your child involved in donating some of his toys or unused clothing to others. Ask him to choose which items to give and talk about how it can help other children whose parents may not be able to buy toys or clothing. Bring your child with you to the store to buy food for a food drive. Ask him to pick out canned or dry goods that you could give to families who may not be able to afford food. When your child sees that he can take steps to make a difference, he may feel inspired to perform more acts of kindness in the future. Talking about poverty may cause your child to become a little anxious. He may worry that you will run out of food or that you might be homeless someday. So it’s important to talk about any safeguards you might have in place. If you have a friend or relative who might help you if you were down on your luck, say something like, “We could always live with Grandma if we didn’t have our own home." Or explain that there are government programs in place that help people who can't afford food. Of course, as an adult, you know that even the best safeguards are not foolproof. You may never have to confront a turn in luck that leaves your family in great need, but we all face that possibility. The best thing you can do for your kids is assured them that you’re always there to love and protect them and, regardless of where your circumstances take you, you always will. Sharing anything beyond that, especially with young children, may be too much for them to handle. American Academy of Pediatrics: Talking About Poverty. Humble S, Dixon P. The effects of schooling, family and poverty on children’s attainment, potential and confidence—Evidence from Kinondoni, Dar es Salaam, Tanzania. International Journal of Educational Research. 2017;83:94-106. Main G. Child poverty and subjective well-being: The impact of children’s perceptions of fairness and involvement in intra-household sharing. Children and Youth Services Review. June 2017. National Center for Children in Poverty: Child Poverty. Pascoe JM, Wood DL, Duffee JH, Kuo A. Mediators and Adverse Effects of Child Poverty in the United States. Pediatrics. 2016;137(4).